Here's an easy and elegant way to transform a humble vegetable to rock star status! 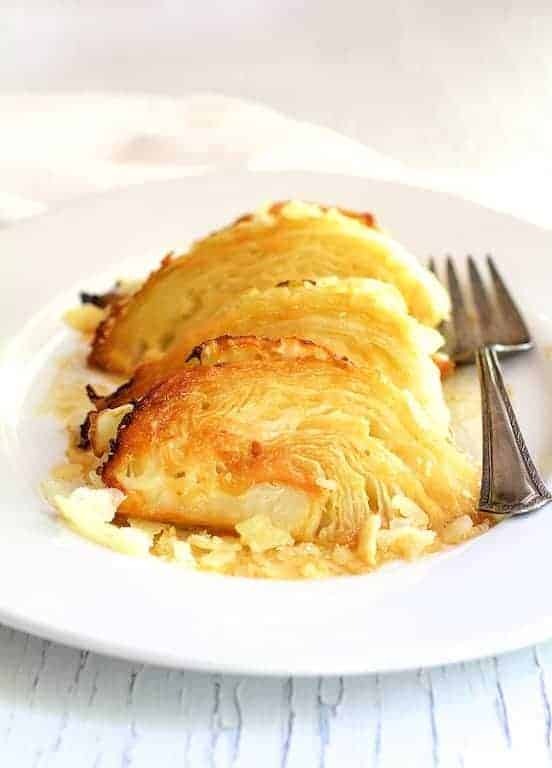 Parmesan Roasted Cabbage Wedges are easy and elegant! 2 cups freshly grated Parmesan cheese plus more shaved into "shards" for garnish. Preheat oven to 375 degrees. Line a baking sheet with non-stick aluminum foil. Spray with cooking spray. Season melted butter with salt and black pepper to taste. Brush over cut side of cabbage wedges. Dredge each cabbage wedge in the Parmesan cheese and place on the prepared baking sheet. Bake for 20 minutes. Carefully flip and bake 10-15 minutes more. Drizzle any browned butter on the pan back over the cabbage. Top with additional shaved Parmesan cheese. Serve immediately.